It’s good to know halfway across the globe there are still bands that are willing to wear neon phallic objects on top of their heads. Urichipangoon formed in 2003 in Osaka with just two members. Their first album was recorded at home and released on a small indie label. The following year, two more people joined, including the drummer from Boredoms. Their 2008 album Giant Club received high praise from Shugo Tokumaru and Ryuichi Sakamoto of all people. “I’ve never set ears on music by such gentle pervs,” so says UA. If Shugo Tokumaru says Urichipangoon is “one of the best pop groups around” I better listen. The first four songs on their myspace come from Giant Club. “Paya Paya” sounds a bit like OOIOO in the beginning, but the violin jigs liven it up. “Zenon” is the best of the bunch even at eight minutes. I enjoyed the random folk instruments, jungle sounds, and banjo “FunaUta” and “TowaNoAi” come from their first album SEN. “FunaUta” has a minimalist, ambient vibe while “TowaNoAi” sounds more like their newer stuff, with the bird calls and vocals. If you enjoy Boredoms or Shugo Tokumaru it’s safe to say you’ll like Urichipangoon. It’s nice to see folk pop make a comeback. You can also order both their albums and a t-shirt via PayPal on the band’s myspace. Michael Jackson died a year ago today. There is no moonwalking here. Finally a techno-rap unit that hasn’t been raped by Mobile Suit Gundam hey. Strap some neon glow sticks on your moped and ride on down to the Tokyo raaaaaaaaaaaaaaaaaaaaave. recoride レコライド formed in 2009 and is fronted by the Cyndi Lauper looking chick in the middle. Their myspace features one and half minute samples from their debut album Zekkyo Midare Rally Land and a couple demos. “Baseball Murder” has a nice 8bit intro and quickly morphs into electro chaos. The rest of the samples follow suit with a mix of electro and new wave happiness. Their album Zekkyo Midare Rally Land came out last November. Buy it at Play-Asia now! Leave it to Japan to give an unknown Swedish pop singer a major label contract. Frida, known as Frida Sundemo everywhere else, will release her debut album Dear, Let It Out this week from Victor Entertainment. “Towers” is the first single from the album and it’s sublime. Her voice is blissful and nostalgic and even evokes the “pleasant feeling of floating” as the video description promises. Samples from the album can be heard here and on myspace. Your electronic disco moves have knocked me off my feet. Rocking all around the floor you never lose a beat. Bodies moving back and forth closer feel the heat. Our electro robotic love started in the street. A few people liked the Bradberry Orchestra’s video the other day so I thought I’d post Shinichi Osawa’s latest single “Love Will Guide You.” It will be released on his upcoming album SO2 later this month. The single starts off as many of his songs do, with a 3-minute intro. By the time the vocals hit, you’re already so absorbed in the electronics it comes off as more jarring than anything else. Thankfully the vocals aren’t too repetitive so it doesn’t matter. Boku wa happy! It scares me when I can understand a lyric in Japanese. But damn did this video make me happy. Put on your favorite sweater-vest and throw your guitar in the air it’s time for an indie-pop hoedown. If you’re into indie-pop bands with a hint of piano you’ll probably love whiteroom. “In My Life” leads off their myspace with an instrumental tune that’s both peaceful and nostalgic. The lyrics to “In Your Life” are simple, but catchy and hopeful. It’s bound to be a youth anthem someday. “A picture perfect” is more mainstream pop-rock while “Lasting Moment” is almost garage rock. The last song we get is “Red House.” It’s a quiet acoustic song that is again peaceful and nostalgic. Whiteroom should have a bright future. Whiteroom formed around 2003 and have been unsigned ever since. According to their website, they have released two albums, both appropriately titled Unique (heh). Naturally, a web search of “white room unique” yielded no pertinent results. I did manage to find a diskunion link on their blog, though. The pandaas uploaded an intimate behind the scenes look at “Old Time” on YouTube. The song is from their 2007 album Days, which you can buy here. It’s nice to see a band joke around and actually smile when they’re playing. If only all recording sessions were this blissful. Can’t get enough of texas pandaa? Their new album Down In The Hole was just released. You can hear three new songs on their myspace and order it at Yes Asia. Or you can wait and buy it internationally from n5MD or Denovali. My name is supposed to be printed in that booklet so I have to get it one way or the other! When you wake up to find your favorite band trending on Twitter, that can’t possibly be a good sign. 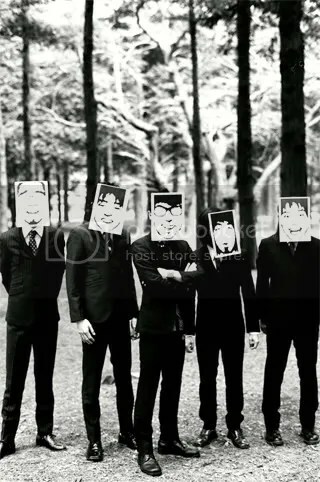 A weird video was uploaded to the Beat Crusaders website today featuring Taro Kato disposing of his band members masks, followed by a text announcement. It basically says that September 4 will be the BEAT CRUSADERS last show and that they will be “spreading out,” a fancy way of saying disbanding. Their last single Situation will be released August 4. You are currently browsing the J-Rock Explosion blog archives for June, 2010.